Electronic artist Baths changes up his focus on Romaplasm, which is about pleasures and fantasies and the past. Album covers can speak as loud as the music it represents. Baths, the electronic project of Will Wiesenfeld, seems to be telling the listener quite a bit with the artwork chosen. The debut album, Cerulean, was abstract and lively and bright, and the album cover was a vivid, neon blue sphere laid against a solid white background. The sophomore release, Obsidian, was noticeably darker and more human, and the cover featured a sky of a thousand grey tones with a human figure in a gargoyle-like stance grimacing, as if getting through was all that they could muster. 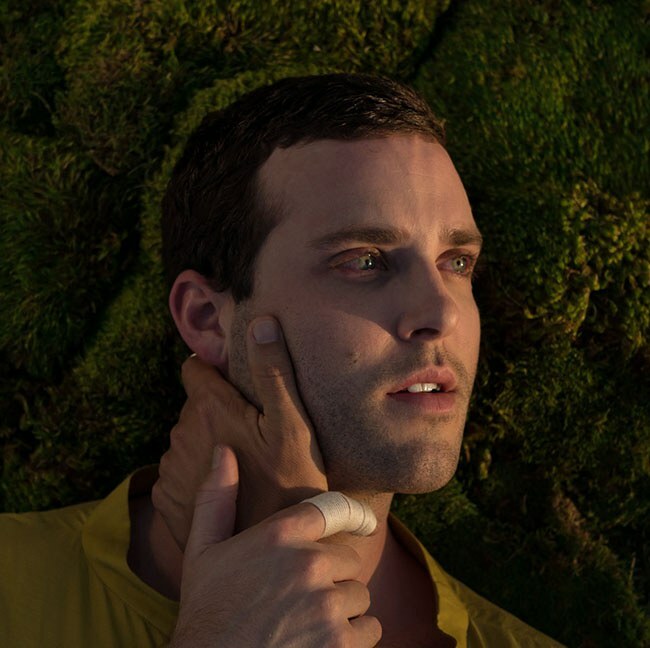 Baths new album, Romaplasm, features a close-up of Wiesenfeld, eyes glistening while someone off-frame places a hand tenderly on his face and neck. As the album cover suggests, Romaplasm is Wiesenfeld's most personal and reflective album to date. That leads to a loss of some of Baths' original charm, but new features glisten in spots, just like Wiesenfeld's eyes on the cover. As mentioned, Romaplasm is a departure from past efforts. Cerulean entered the fold as glitchy electronic was at its peak, and that's what it reflected. Lyrically, the project wasn't ready to show itself. Vocals were occasionally supplied by found samples, and other places, where Wiesenfeld did offer his voice, it seemed distant, abstract, mostly complimentary to the music. Obsidian saw a new lyrical approach, which Wiesenfeld called his vision of pop music. Well, that vision was quite dark. "No Past Lives" and "Earth Death", two tracks juxtaposed late in the album, offer such lyrics as "Hell is our only home", and "Come kill me / I seem so little." Romaplasm, in contrast, is about pleasures and fantasies and the past. The songs jump from topic to topic, but overall, they are just about life, at least Wiesenfeld's fantasy version of it. The opening track, "Yeoman", tells the story of meeting a dance partner that takes him on a cosmic journey, leading to them "placing pushpins on a star chart". "Abscond" starts with the echo of horse hooves and what follows is a medieval love story, complete with castle walls and chambers and guards. The albums blurs into reality after that, at least a poetic version of it. Wiesenfeld tackles topics like partying ("Out"), Growing up ("I Form"), and Industrialization ("Superstructure") with a mostly abstract approach. The songs waver between ecstatic and pleasurable to vague and lifeless. Musically, the music has changed a bit as well. Whereas Cerulean was twitchy, and Obsidian was all over the place, Romaplasm is calm and collected in comparison. A few tracks do freak out here and there ("Adam Copies" being one of them), but mostly the music seems to be made to serve the song and the voice. And that's where the biggest change seems to lie. Wiesenfeld is writing songs as a vehicle for his message, as opposed to the songs being the message. This is where fans will be split. Either you'll like the new Baths, or you'll see it as a little boring or schmaltzy. So, let's go back to that cover. There's Wiesenfeld looking at someone who is holding him. His eyes are bright. He's notably engaged, fascinated, fully there. It's a beautiful visual metaphor. But, there's something off about the composition. The background is unrealistic, strange. That's Romaplasm right there, extremely human, but with an otherworldly twist.